I’ve always liked Martha: She is the example of the service that Pope Francis keeps reminding us of. She reminds me of diaconal service. Her service is diakonia. And this is what this papacy seems to be about. When Francis was elected I said that the Church would become a more diaconal Church. I think that it’s fair to say that it already has. And here in Rio de Janeiro, we have just spent a week of Pope Francis reminding us of this call to service, but he didn’t call it service; he called it love. How do we build the Church? We love.I’ll never forget the three words that he gave us on Thursday night when telling us that we need to be athletes of Christ. How do we train? We train through prayer, the Sacraments and love of the other. They’re all important, yet so often the story of Martha and Mary is interpreted to mean that prayer is the most important part. I don’t mean to imply that prayer is not important; so are the Sacraments, but true, deep and authentic prayer will always lead us to love of other, to service, diakonia. Perhaps that is what was wrong with Martha: Not that she was serving; after all, the guests need to eat and we are called to divine hospitality; but that she was anxious and worried about many things (Luke 10:38-42). 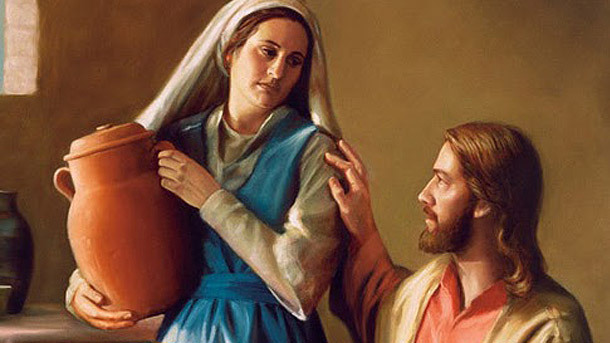 Had she been rooted in prayer and in the Sacrament that was sitting in her living room, the focus of her service would have been love and her desire to serve would not have made her anxious. And how often does the “doing” of Church make us anxious? How often is it stressful? How often is it exhausting? How many people are made anxious by WYD? How many youth leaders need things to be a certain way? How many broadcasters rely on things having to be a certain way? And then we have a new pope and the schedule changes and the liturgies are changed and translations are not available. Then the program in the pilgrim guide is not the actual program, and then the satellite goes down. And there is rain and flooding and the site has to be changed from Guaratiba to Copacabana. And the Vigil is not Evening Prayer but Adoration. These are the surprises God sends us. These are the opportunities that Pope Francis referred to at the Shrine of Aparecida when he said that we need to be open to being surprised by God. And this was the WYD of surprises. Martha was also probably surprised to hear Jesus tell her to slow down. I’ve always imagined Jesus saying that they could just order take-out. Surprise! “We dont need a fancy meal, lets just order pizza.” And I wonder if Martha struggled with that busy-ness for the rest of her life. Did she struggle to stay rooted in prayer and the Sacraments? I struggle with that. Maybe that’s why I like Martha so much. On Friday night, at the Way of the Cross, we heard a testimony from a young seminarian. He prayed for strength to be able to carry the Cross of being a priest. I’m not a priest, but there is also a Cross of being a deacon. And it’s the Cross of service. It’s easy to stay in our comfort zone, inside the Parish, in the comfort of the hospital or seniors home, in our scheduled ministries. It’s not as easy to truly love the other: The other in our families, in our workplaces, in our communities, our neighbour. Who is my neighbour? The guy who lives next door to me. That is my neighbour. And Pope Francis keeps reminding us that the doors of the Church need to be open, not so that people can come in, but so that we can go out. Go and make disciples of all nations. Go be missionaries of love. We don’t have to venture too far from home to do that. How do we rebuild the Church? We love. Yet love means the Cross. Laying down your life for someone else is the Cross. Being open to God’s surprises is the Cross. Having to be present to the other, being authentic to the other is the Cross. Still, when we do it out of love, and it is rooted in prayer and the Sacraments, it doesn’t feel like a cross. And it was that same Martha who was too anxious and worried, when her brother Lazarus died and Jesus asked her, “do you believe?” who gave one of the only five confessions of faith found in the Gospels. She said, “Yes, Lord, I believe that you are the Christ, the Son of God.” (John 11:27) If I am to say the same, I have to let Him be God.As I reflect on all of this, I remember our little English-language Mass the Sunday before WYD at a local parish a block away from Copacabana Beach with Bishop Vincent Long of Melbourne, Australia. The Gospel reading was the story of Mary and Martha. And so, for me, this WYD took place between two Marthas: One who was anxious and worried, and one who was open to being surprised by the one who is the Resurrection and the Life. This was the WYD of transformation. The WYD where pilgrims came as disciples and left as missionaries. And what is found in-between those two? The Cross. It is the Cross that allows for this transformation. It is in being able to say, “not my will be done, but yours,” that God can truly use us. And now it is that very Love, the One who is Love, that calls me by name, to pick up my Cross and follow Him to the ends of the earth to go make disciples of all nations. I don’t want to run to the Cross, but I do want to run towards Love. Come with me. Let’s not stay up in the balconies; let’s be protagonists of change: Let us go and make disciples of all nations!